The bible teaches that all things come from God, even our finances, and that all things should be used to his glory. 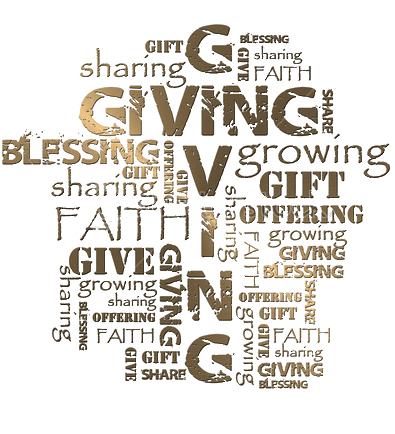 As Christians we believe we are called to give to God through giving to the church and others part of our income as well as our time and abilities. The Old Testament talks of ‘tithing’, giving 10% of your income to serve God through supporting the local ministry. We can give through one off gifts, regular giving and sacrificial giving, the principle is the same we are to support the mission of the church and to give to the poor and needy both bring glory to God as the money given transforms lives. When we give a part or all of our ‘tithe’ to the local church we show our support for their ministry and mission in the local community. St Wilfrid’s uses the money given to support the everyday running costs and the ministry and mission in and around calverton, as well as the wider ministry of the diocese and other mission societies. We tithe our income and support mission agencies abroad in Burundi and Bangalore as well as closer to home with Framework. Get on the ladder – make a start. Begin small and build up your giving and where possible gift aid your giving because the government will give 25% extra to whatever you have given at no extra cost to you. Regularly give – 10% or a proportion of your income to those in need. Decide who you are going to give to and what proportion of the 10% and give by standing order so you don’t forget. Become a generous giver – use the gift days or one off opportunities to give beyond your regular giving. Below are links to simple ways in which you can give to St Wilfrid’s church ministry and mission. If you would like to give for a specific event or need please let us know. During our services on a Sunday we take up a collection and at other services there is a plate by the door for people to give. We have giving envelope scheme, when you can put cash in an envelop each week, this can help to regulate your giving. By far the easiest and most tax-efficient form of giving, helpful for our own budgeting and yours, is to set up a monthly Standing Order: you can download a gift aid form (PDF format) or pick one up from the back of church. If you are a UK taxpayer, please fill in the Gift Aid declaration in order for us to claim back 25 pence for each pound donated. If you would like to give one off donations you could use a bank transfer online. Account Name: St. Wilfrid’s Church, PCC. Please ensure that your name is included when you make a transfer if you have filled in a gift aid form for St Wilfrid’s. This is a way of giving a lasting gift to your church. Legacies are a fundamental part of stewardship and Christian giving; leaving a gift in your will is one of the most valuable and lasting ways you can give thanks to God for the gifts of your life. This up-to-date national Church of England Legacy website offers essential information for people considering leaving a gift to a church in their will. If you would like to know more about how the money given to St Wilfrid’s is spent please speak to one of the church wardens . As trustees of the charity the PCC has responsibility for the expenditure of the church and seeks to use it wisely for the glory and mission of God’s kingdom.